This recipe came to us after experimenting with various stuffing mixtures for pork chops. We always enjoy combinations of sweet and spicy, and this one certainly delivers. 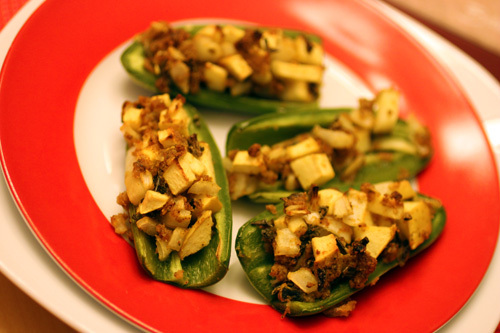 Chopped apples seasoned with Cajun spices make for a delicious stuffed jalapeno pepper. It's perfect as an appetizer or a side dish. Slice jalapeno peppers in half lengthwise and remove seeds. Set aside. Heat a frying pan to medium and add butter. When butter is melted, stir in bread crumbs and mix well. Add remaining ingredients and mix to combine. Use water in very small amounts to thin as needed, but the mixture should be slightly thick and chunky. Fill each jalapeno half with a heaping mound of your stuffing mixture. Bake stuffed jalapenos on a lightly oiled baking sheet for 30 minutes.